I adore everything about Lauren Oliver’s writing. Seriously. She could write 80,000 words about her latest trip to the grocery store and I’d happily pay $17.95 for the hardcover. She has an amazing way with words. She crafts protagonists who are smart and strong and likable, and romantic interests who are thoughtful and layered and, um… hot. A little background: Delirium sat on my nightstand for months. I passed it up time and again because I couldn’t get excited about another dystopian (I’ve been underwhelmed by several lately), and, honestly, I thought the idea of love-as-a-disease was a little hard to buy into . Then I won an ARC of Pandemonium and knew I’d have to give Delirium a go before I could start on its follow-up. Well, turns out Delirium was pretty good. So good, in fact, I dove straight into Pandemonium upon finishing it. Let me tell you, Pandemonium was AMAZING. It grabbed me immediately and never let go. If you were disappointed by the slow pace and inherent quietness of Delirium (I, incidentally, was not), you should know that Pandemonium is quite a turn around. While it’s similar to Delirium in that it boasts gorgeous writing and gripping characters, it’s also action-packed, with tension that made it utterly unputdownable. This installment of the trilogy introduces several new characters, many of whom I came to adore (Julian and Raven, especially). It also delves a little deeper into Lena’s world, the United States that declared love a communicable disease, but if I had one gripe about Pandemonium (and Delirium as well, actually), it would be the slight lack of world building. While reading, I found myself wanting to know more about the restructuring of the country’s boundaries, the government, and the histories of the DFA and varying resistance groups. Something tells me, though, that we’ll get more background in the third and final book of the trilogy. Even considering world building that I found to be slightly lacking, I was still entirely consumed by Pandemonium, a true testament to the importance of exceptional writing, relationships readers care about, and characters they can’t help but root for. And the end… Oh! Em! GEE! 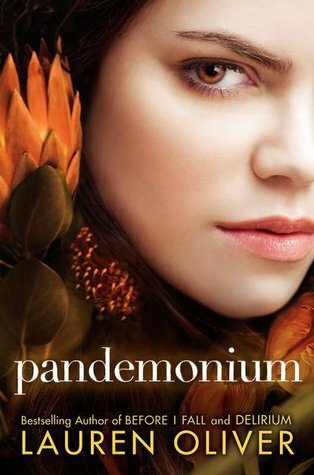 I highly recommend Pandemonium (and Delirium! ), and I cannot wait to read the final book in this trilogy, not to mention any and all of Lauren Oliver’s future work. Jessica Love sings for NEVERSINK – with giveaway! Tell me: Have you read Pandemonium? What about Lauren Oliver’s other books? Thoughts? I’m kind of jealous that you held out long enough on Delirium to read these two back-to-back! The ending of Delirium…SO crazy-making! You also reminded me that I had meant to track down Lauren Oliver’s digital-short-thing, HANA, which I guess tell bits of Delirium from Hana’s POV. I really loved Hana, more than I usually love the best friend, so I’m looking forward to seeing her a bit more. Ooh, I didn’t know about HANA… I’ll have to track that down too. Thanks! And yes, if I had read Delirium last year and had to wait for Pandemonium, that ending would have made me crazy! Now, I have Pandemonium’s ending to drive me nuts until NEXT YEAR! I was so disappointed in Delirium, I almost didn’t read this one, but OMG so glad I did! I think it’s because Lena was not a strong character (or as strong) in Delirium and I LOVED seeing her evolve as a character. Plus, well, the ending still has me going nuts! I wish I could read REQUIEM NOW! And yay! SO glad you won this ARC! Thank you SO much for the ARC, Alison! Obviously, I love it. 🙂 And yes, Lena’s transformation is one of my favorite aspects of this trilogy so far. She rocked in Pandemonium! You’ll have to drop by and let me know what you think once you’ve finished. I hope you love it as much as I do! Glad to hear you liked this one–I enjoyed DELIRIUM but I haven’t picked up PANDEMONIUM lately due to a bit of trilogy fatigue. I agree that Lauren Oliver is a fantastic writer. I’m with you on the trilogy fatigue, Rebecca. I’m glad I waited until now to read Delirium so that I could read the two back-to-back. I’m sick of waiting a whole year between books, but I’m hoping this trilogy will be worth the patience! I have not read either, but really loved Before I Fall, for all the reasons you mention (her stellar and strong characters, beautiful writing, etc). I will have to check these out… but I hear you on the dystopian fatigue. I’m reading Life as we Knew it right now (more post-apocalyptic, technically), and it’s stressing me out. In the good way. I think. I loved BEFORE I FALL as well, Kat, and the DELIRIUM books have the same gorgeous writing. I haven’t heard of LIFE AS WE KNEW IT, but I’ll definitely check it out. I like that good kind of stress too! And now I can’t wait for the next book. I also agree with what you say about world-building. As interesting as the concept of love as disease is, I still have a hard time fully buying into it because of the lack of world building. I saw that ending coming too, Stephanie, but its execution still totally blew my mind. I can’t wait for the final book either… darn these trilogies! I LOVE Lauren Oliver’s writing! It’s gorgeous and enviable, and it totally transports me into her worlds. She rocks! Have you read LIESEL AND PO? I don’t read tons of middle grade, but I just might have to pick that one up. I bet you’ll love Lauren Oliver, Elodie. Her writing is gorgeous, and her protags feel so layered and real. I highly recommend her work!